Date: Oct 13 2018, 5 p.m. - 10 p.m. Enjoy German food, German music and hoist a mug and shout, “Eins, zwei, gesoffen! (one, two, I’ve drunk it!)" at Fort Lee's annual fun-fueled Oktoberfest celebration. The Original Elbe-Musikanten German Band will entertain all night with polkas and party music that is sure to get your feet tapping while the Hirschjaeger Dancers perform the authentic German folk dances. Children will enjoy the KidZone’s inflatable games. This event is open to the public. Food and beverages are purchased separately. 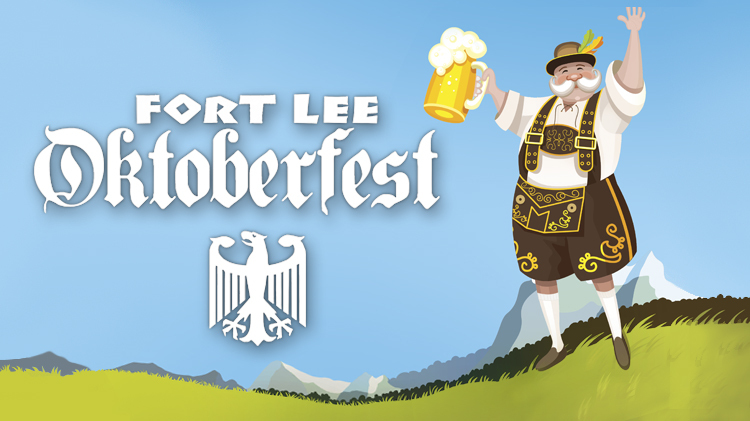 You may now also reserve the limited-edition 2018 Fort Lee Oktoberfest Commemorative Mug for only $28.00 which includes the mug, event admission and the first fill of the mug. Both the Commemorative Mug and advance tickets may be purchased at Leisure Travel Services, the Cardinal Golf Club, the TenStrike Bowling Center or at the Lee Club at the Soup & Salad Lunch. Advance Tickets may also be purchased here. Reserve your Commemorative Mug/Admission Ticket/First Fill Oktoberfest Package here. This event is made possible thanks to First Command, USAA, and Sprint.